A big, honkin’ ham is the centerpiece of most Easter tables, but I think the spring flavors of the side dishes really make the meal. So does Andrea Weigl at The News & Observer (Raleigh, N.C.). Her section has a bevy of beautiful dishes to dress up the table. Read more here. Kathleen Purvis at the Charlotte (N.C.) Observer hops into a debate over the best candy in Easter baskets. If your chocolate bunnies are ear-less within minutes on Easter morning, visit here. Greek food traditions for Easter are the focus at the Winston-Salem (N.C.) Journal. Mmmm… brings back memories of the first time I ate baklava, at the Greek Orthodox church’s festival in Winston-Salem. For a while, I thought all that Greeks ate was honey and powdered sugar, not that there’s anything wrong with that. Read the article here. And because the Final Four is going on this weekend in Indianapolis (and I am well aware that the Evil Empire is playing), I checked out the Indianapolis Star’s food offerings. There’s a feature on a chef who has an unusual clientele: Strippers (oh, excuse me, “exotic dancers”). He bares all here. Remember that humongous ham? Bill Daley at the Chicago Tribune suggests wine to go with it. Sweet iced tea always works for me, but take it up a notch with his suggestions here. I just got back from carrying a lovely tray of deviled eggs to NBC-17 in Raleigh, N.C., where it and I will be featured on the new local show, My Carolina Today. The segment with host Valonda Calloway will be shown Thursday, April 1, at 11 a.m.
Don’t forget to come out to the spring opening for the Wake Forest Farmers Market this Saturday, April 3. I’ll be there, selling and signing cookbooks, and offering samples of deviled eggs, of course. I’ll be at the market in downtown Wake Forest, N.C. from 9 a.m. to noon. It’s certainly egg time around my house. It’s funny – you write a little cookbook of deviled egg recipes, and people begin giving you deviled egg plates. I have about a dozen now. Besides the symbolic aspects of eggs for the holiday (rebirth), deviled eggs are just so pretty for spring meals, and easy to make. Shake off the old paprika-pickle relish stereotype this Easter with this recipe from my cookbook, “Deviled Eggs: 50 Recipes from Simple to Sassy,” published by Harvard Common Press. It will also work for your Final Four party if you’re a fan of what, in my house, is called the Evil Empire. Combine the thoroughly mashed yolks with the mayonnaise and mustard. Add the blue cheese and mash well into the mixture with a spoon. Taste, then season with salt and pepper. Fill the whites evenly with the mixture and garnish each egg half with the bacon bits. There are many advantages in being married to a geek. Just one is that I never would have seen this interesting article in IEEE Spectrum, since that engineering, computer and technology magazine isn’t at the top of my reading list. “Molecular Gastronomy Goes Industrial” talks about how chefs are using technology from the mundane food processing industry on high-end ingredients like lobster. There’s a combination liquid nitrogen freezer (the darling of the molecular gastronomes) and Cryovac sealer. Even a sous vide for home use – at a mere $449. A most interesting note is the New York bartender who uses a tabletop dehydrator to make Kahlua-soaked Rice Krispies for a breakfast-themed White Russian. Snap, crackle and pass out? An update on Fullsteam Brewery in Durham, N.C. and a story on a farmers market on the campus of Raleigh’s N.C. State University (written by your humble blogger) are in The News & Observer (Raleigh, N.C.) today. Find both here. The Charlotte (N.C.) Observer highlights something that was bound to happen eventually: Cooks who cater the Passover Seder. The article is here (also in the N&O). The Winston-Salem Journal has the tale of a former chef for a drag-racing team who now hosts a show on the Speed Channel called “The Racing Chef.” But no fast food from him – the article includes a recipe for hoisin-glazed pork that sounds good enough to get even Jimmy Johnson to slow down and eat. Catch it here. I wonder if this doc would make house calls to North Carolina, because I want her to be mine – a Dallas physician started a chocolate business. Read about her in the Dallas Morning News, here. The Western Wake Farmers Market in Cary, N.C. has a big celebration planned for its spring opening on April 3. Chef Ricky Moore of Giorgio Restaurant in Cary will share samples of Goat Cheese-Lavender Fritters with Local Honey, there will be information on starting community gardens, face painting for the kids and live music. The market will be open each Saturday from April 3 through Nov. 20, 8 a.m. to noon, at 1226 Morrisville-Carpenter Road, Cary. The growers/producers only market sells goods made within 125 miles. For more information, check the web site. The final nominations for the James Beard Awards were announced today, and two Triangle chefs remain in the running for the national honors. Andrea Reusing of Lantern and Bill Smith of Crook’s Corner, both in Chapel Hill, N.C., are two of the five nominees for Best Chef Southeast. The other nominees are Sean Brock of McCrady’s in Charleston, S.C. and Hugh Acheson of Five and Ten in Athens, Ga. Boy, did I open up a clamorous can of worms. In my recent Sunday Dinner column in The News & Observer (Raleigh, N.C.), I complained about the increasing noise level at new restaurants. It was spurred by a visit my husband and I paid to a new place that sounded like a room full of jackhammers. I didn’t and won’t name it, because the point was not to call out one particular restaurant – it could have been one of many. Well, I received tons of email from readers with the same complaint (not all as old as I am, by the way). Then, my friend Greg Cox, restaurant reviewer for the N&O, called. He had received a flood of reader comments about the column. The result, as Greg explains today in his Chew On This column, is that he will add a “Noise level” line to his reviews with an estimate of the dining din. Noise level can vary over the course of an evening, and the judgment is somewhat subjective, but it will give readers some idea of what to expect. Read Greg’s column here, and my original Sunday Dinner here. The food section for the News & Observer (Raleigh, N.C.) highlights the culinary job training program operated by the InterFaith Food Shuttle. The organization, which picks up donated food and provides it to shelters and soup kitchens, started the training to help unemployed folks, who may have few skills, get the training they need to work in food service. The article reports that the program has a 70 percent employment rate for trainees. Read it here. Concord, N.C.’s Avett Brothers are the hottest thing in songwriter-rockers, and the band’s cellist (yes, a cellist in a rock band) is hot in the kitchen, too. The Charlotte Observer features Joe Kwon, who talks about how food and music intersect (the article is in the N&O, too). Read about him and his recipes here. Ever heard of Albanian food? Neither had I, until I read the article in the Winston-Salem (N.C.) Journal about a Southern Pines company that is finding success with it. Read more here. There’s always a different perspective on food in the San Francisco Chronicle. This week, it’s debunking stereotypes about Indian food. Read more here. I told y’all pies were the new thing. A total of 250 recipes were entered in the Memphis Commercial Appeal’s pie contest. The winner was a chocolate-macaroon pie with mascarpone topping. Find the recipe here. beer tasting at Aviator Brewing Co.
For our second “beerventure” on Saturday, my husband and I attended the first of a two-part beer class/tasting at Aviator Brewing Company in Fuquay-Varina, N.C. Mark Doble started the brewery in 2008 in the hangar next to his plane, hence the name. Last fall, he opened a tap room in downtown Fuquay because so many people were visiting the brewery during the limited hours it was open for tastings. Only one beer is bottled – a stout – and the rest are sold by keg to bars and restaurants or via growler to thirsty visitors. The beers offered change with the season and the fluctuations of Doble’s creative mind, but 18 are part of the repertoire (not all offered at the same time). The six of us in the class sampled a flight of four beers, progressing from lightest to darkest: Gremlin’s Golden, Devil’s Tramping Ground Tripel, Old Bulldog ESB and BoneHead IPA. When we started, he placed a pint of the Gremlin’s outside in the sun – more on that later. As in wine tastings, we were encouraged to note the aroma and color of the beers as well as the flavor and compared our perceptions. The Gremlin’s, classified as a blonde ale on the beer family tree handout I received, had a light grain flavor, an overall clean taste and light mouthfeel. It had the lowest alcohol content of the four at 5.5 percent. The beers we tasted ranged in alcohol up to 9.2 percent (the tripel). Doble offered a geeky explanation of alcohol, carbohydrates and sugar that, frankly, went a little over my head (they guy’s an electrical engineer in his day job, after all). I’ve never been clear on why different beers vary in alcohol percentages, so I called Daniel Bradford at All About Beer magazine in Durham, N.C. Bradford offered two explanations. 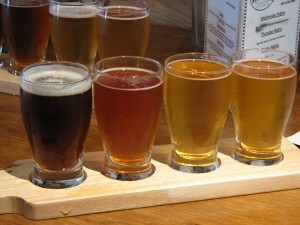 One is that certain alcohol percentages are traditional for certain classic styles of beer. Before refrigeration was available, alcohol (and hops) served as preservatives. So, Russian imperial stouts, which were shipped across the large country in the days of the czars, are traditionally higher in alcohol. Or, as beer experts term it, “higher gravity.” Alcohol also adds calories, so dopplebock, originally brewed for monks’ nourishment during Lent, are higher gravity. The second explanation is the experimental nature of modern craft brewers, “just seeing what you can do, how far you can stretch it,” Bradford said. As with hot sauces, there are some people who care about the flavor and others who just want to make something so fiery it blows off the top of your head. But the best craft brewers, Bradford said, are interested in the flavor, not just potency. Glad I cleared that up. Now, at the Aviator tasting, the Devil’s Tramping Ground was smooth and sweet, with little bitterness and a rich amber color. Doble named the beer after the legendary spot in North Carolina where the devil is said to pace about – he said it’s traditional to name tripels after the devil. The Old Bulldog ESB (Extra Special Bitter) was a surprise to me. It smelled like toffee but had a roasty-toasty flavor in the aftertaste. Despite the name, not a lot of bitterness. Fascinating. Doble said that his goal for the BoneHead IPA (India Pale Ale) was to create a beer that screamed “hops,” and it did. It was my least favorite because of that heavy hops bitterness. After about 30 minutes, he retrieved the pint left on the deck and passed it around. “This is what a light-struck beer tastes like, and it’s going to smell and taste like a beer that’s very familiar to you,” he said, smirking. The group agreed that it smelled like Corona and tasted like Heineken. Yuk. That’s what happens when you have to ship a mass-produced beer many, many miles. Better to stick close to home.